I’ve Got a Little Lefty! Now What? While the odds are strong that your child will be right-handed—90 percent of people are—you might still get gifted with the outlier; a little lefty. Here’s how life will be (slightly) different for them. First things first—your tot may not actually be left-handed. 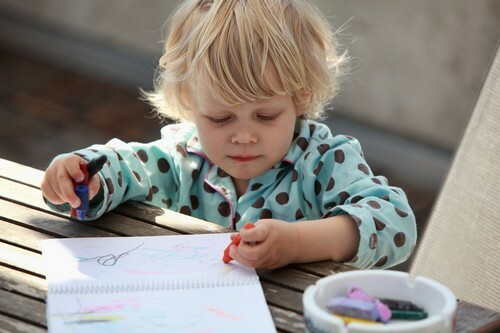 Babies don’t tend to play favourites when it comes to their hands; only at around 18 months should you begin to see a preference when they’re using utensils or gripping a crayon. By three years of age, you should be certain of their hand status! By virtue of the fact that most consumers are right-handed, products will be tailored to suit them—not lefties. Scissors can be especially tricky, as well as cameras and computer mouses. You can buy left-handed scissors, but for other things, you might find it beneficial to teach your tyke to power up his right side in the event of no alternative. In western countries, we write from left to right. This allows ink to dry as you continue along the page—if you’re right-handed, that is. Lefties will suffer the scourge of smudgy handwriting, and will also find the traditional shaping of letters more difficult than their right-handed counterparts. Allow them to try out forming letters in a directional sequence that suits them, and to shift their paper around while working if it stops the smudging. Guitars will need to be restrung (most lefties strum with their dominant hand which means the strings are in reverse order), and drum kits will have to be rearranged—the snare, kick drum, etc. placed on opposite sides. The superstition surrounding lefties may be long gone, but kids born a bit different from their peers will still feel the sting of being ‘other’. What you can do is emphasise the special status of their uniqueness—after all, they made it into the ten percent! Practically, it’s important they’re never forced to conform to right-handed positioning if it makes things harder; have a chat with teachers and coaches to have everybody on board.